It is election fever. So, what local dish should I blog on? Bak Chor Mee? Or "Mee Siam Hmm Mai Hum'? Oh well, I better not. In my profession, I am suppose to be neutral and not take sides. Not that I think any of my members will take my political views seriously. Should you rock the boat or go with the proven? You may like to read an earlier post where I attempted a political dig. So, I will blog a dish from a country which was rocked very seriously recently: Japan. Let’s support this country, shall we? I'd like to blog a sushi dish which I find to be very satisfying: a Chirashi Sushi dish which I learnt recently from Chef Shinichiro Takagi, who was one of the visiting Master Chefs for the World Gourmet Summit. He is the owner and main chef at the famed Zeniya Restaurant in Japan. iEat's Leslie Tay has also blogged about his cooking here. At the class, I asked him whether he planned on opening an outlet here. He said, "Yes, but I am still looking for a leader-type person!" Interesting. Leaders seem to be needed everywhere - in politics, churches and even restaurants. Now, what was I trying to say? Hmmm….oh yes, Chirashi Sushi. Quite a tongue twister.It is basically Sushi in a bowl. The sushi rice is put into a bowl and then ingredients are scattered onto it. No need to get your hands sticky. No need to make any sushi rolls. It is a good beginner dish for sushi learners. It can be served as a one-meal dish. Just get good and fresh ingredients and assemble them. There is minimum cooking for this dish. If you are creative, you can assemble your own ingredients and come up with some satisfying meals. Let's get down to Chirashi. What I will blog here is a simplified version which is likely to make a Japanese purist cringe. I too cringe when I read some of those Westernised Chinese recipes. In a globalised world today where we courageously use and adapt info, we shall be generous with each other. In fact, let’s cringe together. As long as we enjoy each other's food, there are no sacred cows. I do not know what this dish is actually called and so I will just name it after the chef. Use dried Japanese Shitake Mushrooms if possible, but the cheaper Chinese version is also fine. Soak the mushrooms in water for 30 minutes. Drain. Cut off the stem and slice the mushrooms into 4-5 pieces. In a pot heat up some water. Add 2 tablespoons of soy sauce and 1 tablespoonful of sugar. Braise the mushrooms on low flame for about 30-40 minutes. Then rinse it and let it cool. Chop up the mushrooms into fine pieces. There are many online instructions on how to make Sushi rice. First, buy Japonica short grain rice. About any brand will do. NTUC, Cold Storage and of course, Meidi-ya Supermarket at Liang Court (formerly Daimaru). For a cup of rice, use a cup of water. Use your normal rice cooker. After it is cooked, transfer to a large bowl. Add some sugar and salt to taste. Add vinegar. Fan (if you are traditional) or use a electric side fan to cool the rice as you stir the rice with a flat spoon (to avoid breaking up the rice). Set aside. After it is cool, cover the bowl with damp cloth to prevent the rice from drying up. You can ignore this step if you are preparing and serving the dish immediately. Add the chopped mushrooms into the rice and mix. This needs some patience. First, break the eggs into a bowl and whip lightly. Add some salt (a pinch) and sugar (dashes). If you have mirin, adding some will add some flavour but this is optional. Sieve to remove any clumps of gelatin. Heat and lightly oil up a flat pan on low flame. Now, cover the pan with a thin layer of the egg mixture. You are cooking it one layer at a time. Once the egg is set and firm (but not browned), loosen the edges with the sharp end of a pair of chopsticks and flip over, using your fingers. (If you can't take the heat, wet your fingers). Cook it for a few secs more and put it on a plate. Repeat process for the rest of the mixture till you get a nice pile. I did say you need patience. I took about 20-30 minutes to do 10 eggs. This Tamago thing does need practice to do it perfectly. Now roll some of the layers tightly and using a sharp knife, and while pressing tightly with your other hand, cut them into fine strips. Bear in mind that eggs done this way is lovely for this dish and sets it apart. It feels like you are eating noodles. Prawns Blanch the prawns. It should need no more than a few minutes. Then cool them off in cold water. Peel the prawns. Off with the heads. Cut along the back and remove the black residue if you see any. Cut the prawns into small pieces (about 1 cm). If you do not like the prawns to curl up when cooked, stick a skewer or wooden satay sticks into it when it is being blanch. Note: The best prawns for this dish are the tiger prawns (their shells are darker than the grey prawns). The meat is crunchy and firm, unlike the grey prawns. If you can’t get them, then use the next best prawns you can find, maybe the angka white prawns. Unfortunately tiger prawns have become scarce and expensive these days as they are less in demand for stir-fry dishes while farmed grey ones are cheap and more suited for most Chinese dishes. This is basically grilled eel. The locally available ones are generally good. Good unagi should have no mud taste, bones, with a nicely textured bite and not mushy. You can also buy them off the popular Yakitori stalls in shopping complexes. Cut them into strips as in pic. Put a handful of sushi rice (already mixed with mushrooms) into a bowl. Then scatter the ingredients. Eggs first and decorate the rest on top, last one being the rocket leaves. If you plan on serving it later, just cling film the bowl. Eat with wasabi and soy sauce. With chop sticks of course. This way you get to savour the ingredients separately or eat in smaller portions. Remember to dip in some wasabi and soy sauce. Or just use the fork. Use hands? No. No... cringe. This is just good rice with good ingredients on top. You can make many types of Chirashi. Put in what you like to eat and test out various combination. Char Siew Chirashi? Hmm...why not? Though I have no memories of my Mum ever making anything that comes close to this, I found it to be comfort food. 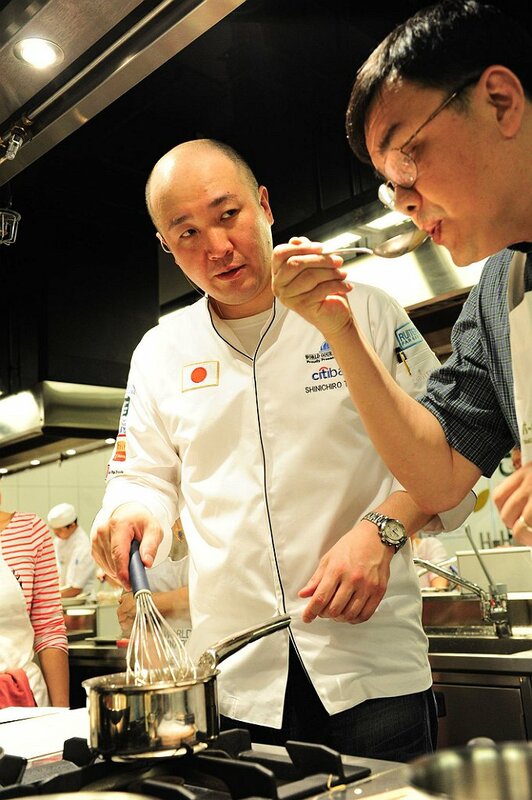 And thank you for the lesson, Chef Takagi.